Measuring Is for the Birds! Lately, everything is a measure of comparison around here. I think this is how most preschool and early elementary minds think best? Our days are peppered with: Who is taller, Isia or Billy? Is the bookcase taller than Daddy? Is the counter-top too tall for Esther to reach? (Not anymore!) This real-life "school"- thinking on their feet- is how my active kids think best. So when we were reading Chapter 5 of Burgess Bird Book for Children together, Isia wanted to know just how much bigger Welcome Robin was than Jenny Wren? We measured lines on a piece of paper- one Robin-sized, one Wren-sized- which helped a bit. Then I drew these real-life size examples, which helped a lot. Her first question was, "Is a Robin really that big?" She was surprised by the Sparrow's size, too. Then I realized that birds are usually viewed from far away- which doesn't allow kids to realize their actual size. She was thrilled to hold them, and then wanted to start measuring things "in birds." (To help keep our measuring consistent, I put a black dot on the side of each bird to help us.) We measured a chair, a book, and a few other things using the Robin. Then I suggested we measure them again using the Wren and Swallow to see if there was a difference. I created this chart for us to record our measurements, which I'm including as a free printable at the very end of the post. I'm also including a blank chart, a Robin printable, a Wren printable, and a Swallow printable. Isia is now asking for drawings of more birds, including a Blue Jay (which is Daddy's favorite). In the words of Anne Lamott, I promised we'll take it "bird by bird." 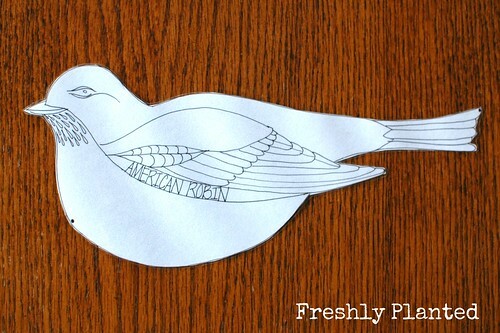 Laminate the birds (here's our very economical laminator), then color with dry-erase crayons. Have older children reference a Bird Guide for proper colors & markings. Practice math equations by discussing "How many more Wrens than Robins for a chair?" and comparing together. Keep repeating for different objects. 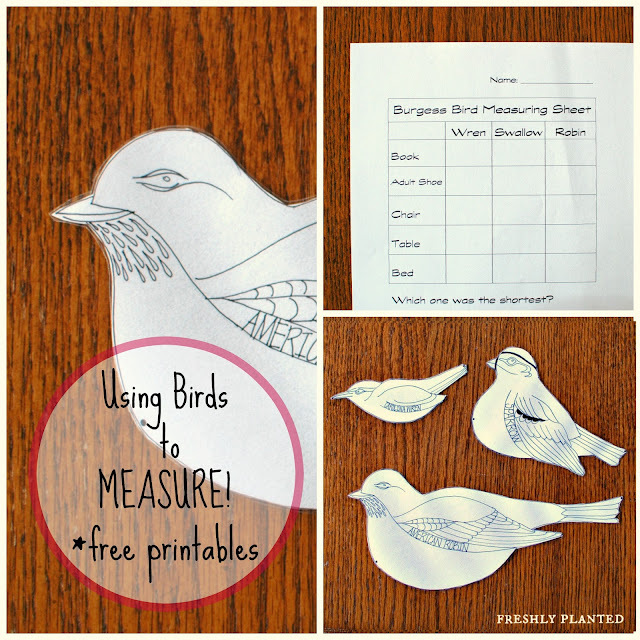 Write out math equations on paper, comparing different bird quantities for each object. Fill in the blank graph sheet (included below) with your own items to measure. What an awesome activity! I remember when my daughter was young, she would watch the birds out the window every morning (it was one of our daily activities) but was always to sad when she went outside that the birds wouldn't stay around the play with her ;) Love this idea! What a sweet story, Jacquie! 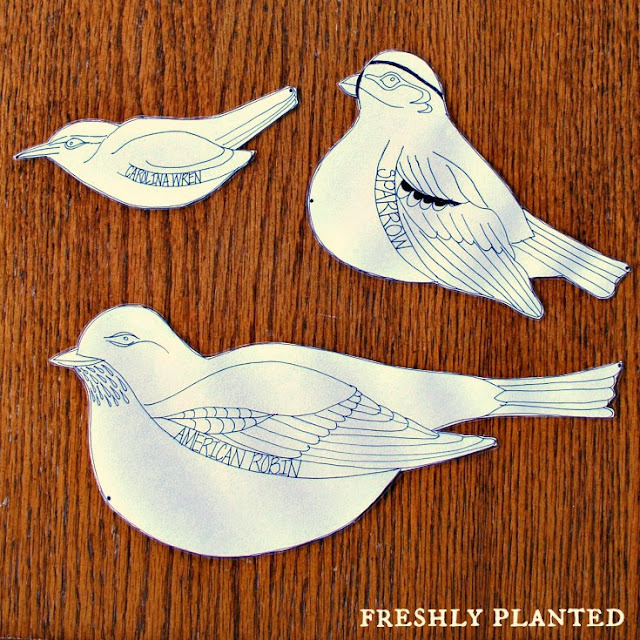 Our kids keep trying, but our birds won't stay & play either ;) Thank you for your kind words!